Now You Can Create Ads Where 75% Of Users See Them, On Smartphones! Did you know that 75% of Facebook traffic occurs from mobile devices around the world? So wouldn’t you think that mobile ad managing is the same way? Probably not yet because Facebook just launched its Ads Manager app a few months ago – while the Facebook mobile app itself has been around for years. Let’s create a campaign! I’ll use my friend Dennis Yu’s page for explanatory purposes. You can either boost a post you’ve made already, reach people near your company’s business address (location targeting), or send people to your website. From here, it’s easy enough to tell that the next step is to choose a picture from his page, or you can take a picture with your smartphone’s camera. To help you out, Facebook includes the following about Interests. For example, a flower shop might choose an interest like “weddings”. Be elaborate to get the most out of your targeting, but also certain that the people you target will desire to know more about your ad. You’re almost done! Now just choose your budget and schedule and you’ve made your first ad! *If you’re just starting out, Dennis Yu has an amazing concept of Facebook marketing with gaining results at just $5 a day. Over the last few years, the US has shifted heavily towards Apple’s iOS and Google’s Android models, leaving BlackBerry struggling. However, BlackBerry has been able to become a highly popular device in Latin American and some Asian countries. Fan growth month / month is only 1%, while PTAT month / month is 2%. These slow numbers show that Blackberry has stopped advertising in the US. From our data, we learned that US fans tend to purchase new smartphones frequently and are likely to switch to phones with the most advanced features. Countries like Brazil, Argentina, and Colombia show an influx of new smartphone users, many of which are buying BlackBerry phones. 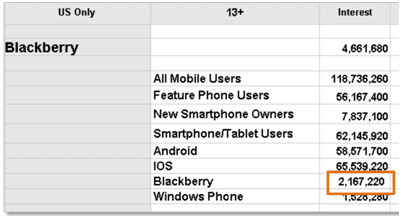 In the US, Blackberry makes up 1.9% of smartphone users on Facebook, only beating Windows phone, which has a 1.4% share. 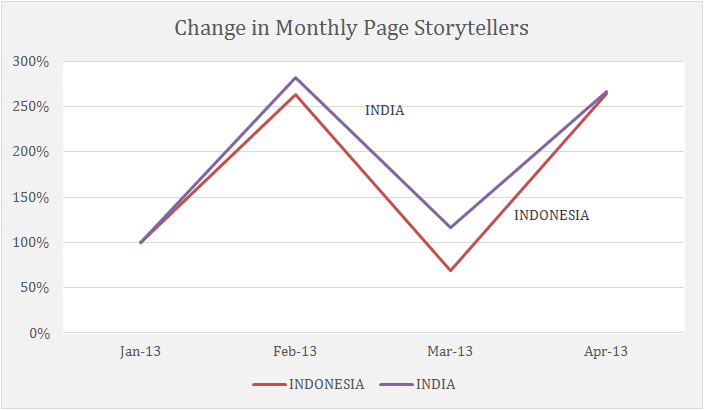 The United States has only had an increase of 2% in storytellers each month. Despite weak performance in Canada and the United States, Blackberry has a sizable share in the Latin American and Asian smartphone market. India has a 19% month / month growth rate and an active user (PTAT) base of 870k, which dwarfs everyone else. Blackberry currently has a market share of 60.4% in Venezuela, 40.5% in Columbia, 10% in Mexico, and 13.3% in Peru. For the last few years Blackberry has always been on the lower end of smartphones, which makes sense why it would perform so well in emerging economies. 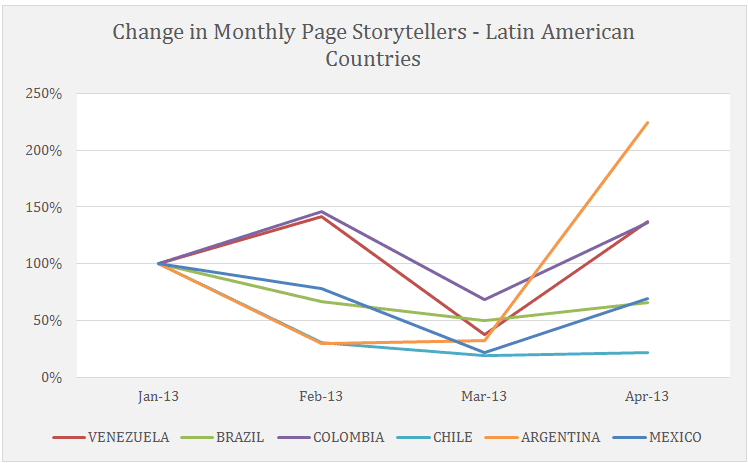 Blackberry’s presence in South America on Facebook is growing. Colombia has a 6% month / month fan growth rate and a 100% month / month growth in PTAT. Argentina has a 13% month / month fan growth rate and a 584% month / month growth in PTAT. Peru has a 2% month / month fan growth rate and a 28% month / month growth in PTAT. This huge growth in PTAT suggests that Blackberry has heavily advertised in these countries, which was a smart move. The traffic is cheap and a sure way to increase awareness in these markets. Keep in mind these numbers don’t fully suggest a growing market share in these countries due the inflation of numbers via advertising. Two other success stories are India and Indonesia. Blackberry has a 31% share of mobile phones in Indonesia. On Facebook it also has an 8% month / month growth rate and a 287% month / month growth in PTAT. India only has a 1.6% market share, but a 19% month / month fan growth rate and a 130% month / month growth in PTAT. It is obvious that, in both markets, Blackberry has been advertising heavily to achieve the large increases in PTAT. We looked at the posting cadence between all countries and found that the US posts 1 -2 times each day, compared to Latin American countries, whose pages typically post every 2 – 3 days. This frequency seems to work particularly well for Mexico, Venezuela, Colombia, and Argentina, who all have a higher PTAT than the US. 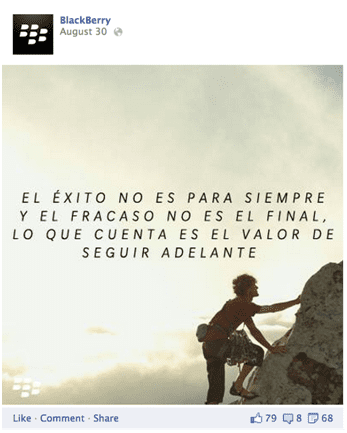 This reflects the fact that Latin American fans are less tempted to purchase new smartphones to try new models and features, and more likely to stay loyal to the Blackberry brand. When we looked at post types, we found that all audiences are engaging with similar content with only slight differences from country to country. Overall, photos are resonating best with fans, followed by videos, links, and status updates. Mexico has the highest average PTAT at over 30k for video posts, followed by Venezuela at 7k (photos), and Colombia at 6k (videos). In every region, Blackberry’s most engaging posts have to do with new phones, features, and products. Like Apple, Blackberry is seen as a genuine brand complete with a die-hard user base, whereas competitors such as Windows Phone or the Android Phone are licensed based and can vary drastically in quality. We’re unsure what’s going to happen, but if BlackBerry is able to privatize, it has a good shot at doing well internationally. Chances are they will never recapture their share of the US market, so they should continue to focus on Latin American and Asian countries. Still, this brings up an important question – can engagement translate to business success? Also, what are Blackberry’s new fans worth? It is a debated subject, and hard to really say. The key is to make sure you are working with your other marketing channels to drive sales. Positive interactions may mean that the audience is receptive, but people don’t buy phones on Facebook. Travis King manages Facebook marketing campaigns and works closely with companies such as Marketo and Digital Trends. His area of expertise includes B2B marketing and campaign management. He graduated from Portland State University with a degree in History. Outside of work, Travis plays in a band and enjoys cooking, biking, and gardening.